Pre-Workout supplements such as HARD WORK™ have become a staple for kickstarting serious training sessions, however, what you ingest during your training can be equally as important for achieving maximum results. 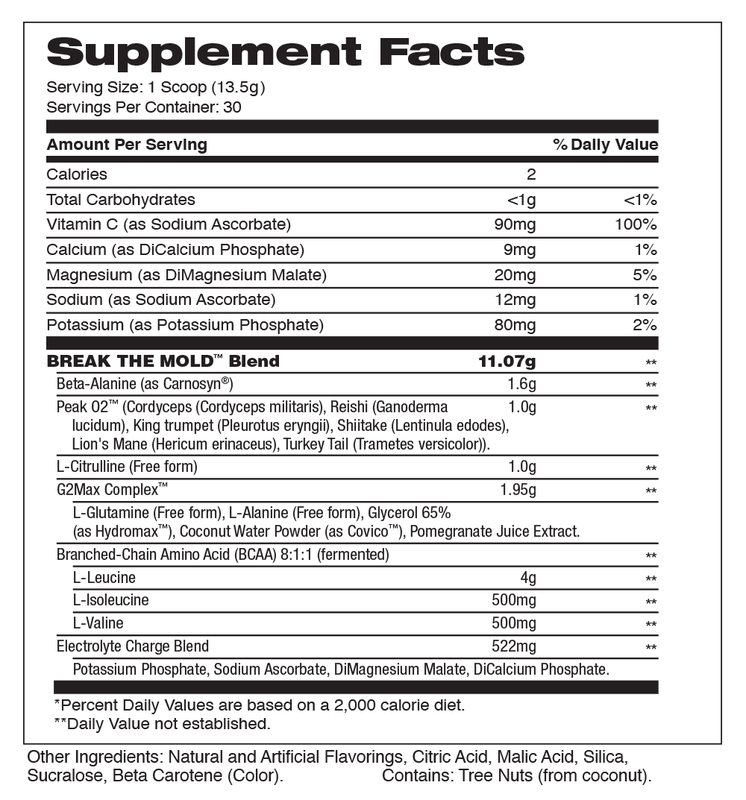 The demand for a supplement that can supply the body with current, cutting-edge, stimulant-free ingredients backed by science is the reason BREAK THE MOLD™ was developed. BREAK THE MOLD™ is a new-age, intra-workout supplement formulated with Electrolytes, Amino Acids, Carnosyn®, Peak 02® and 5g of an 8:1:1 ratio of BCAAs. BREAK THE MOLD™ was formulated with the high-intensity athlete in mind who tends to train harder and longer than the average individual; an athlete that one might say has greater work ethic than others in the gym. Meticulously designed and efficacious enough to earn our stamp of approval for production, BREAK THE MOLD™ is here to redefine the intra-workout category! SUGGESTED USE: As a dietary supplement, mix one scoop with 8–12 ounces of cold water and consume during training. ALLERGY INFORMATION: Contains tree nuts (from coconut). Manufactured in a facility that procesees milk, eggs, shellfish, tree nuts, peanuts, wheat and soy.